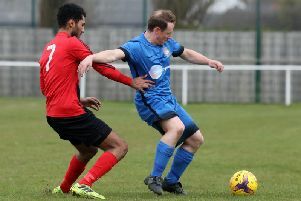 Rothwell Corinthians made it two wins out of two in the ChromaSport & Trophies United Counties League Premier Division as they fought back from a goal down to win 2-1 at Peterborough Northern Star. Corinthians fell behind to Levi Wright’s fine strike but levelled when Jory Mann caught the home goalkeeper out with a 40-yard free-kick. And Mann was the hero for the visitors as he also grabbed the winner in the second half. After success in the FA Cup and in the league midweek, Desborough Town slipped to their first defeat of the season as they went down 3-1 at Yaxley. Dan Cotton gave Yaxley the lead before Jason Turner brought Ar Tarn level just before half-time. Matt Sparrow regained the advantage for the hosts and Cotton rounded things off with his second of the game. Wellingborough Town also lost 3-1 as they went down at home to Sleaford Town. Deven Ellwood put the Doughboys in front but a Ryan Oliver penalty and further goals from Pete Sutton and David Hone sealed the points for Sleaford. Joint-bosses Ben Lord and Wayne Abbott picked up their first win since taking over at Rushden & Higham United as they triumphed 2-0 at Melton Town in Division One. Ryan Kalla was the hero for the Lankies as he grabbed both goals. Raunds Town also claimed their first win of the season as they ran out 3-1 winners at Blackstones. Charley Evans was on target for Burton Park Wanderers as they earned their first point of the campaign with a 1-1 draw at Woodford United. But there was disappointment for Whitworth, who went down 2-0 at early frontrunners Oakham United, and for Stewarts & Lloyds who suffered their third defeat in as many outings as they were beaten 4-0 by Bugbrooke at Occupation Road. Irchester United entertain local rivals Thrapston Town at Alfred Street this afternoon (Sunday, 3pm).